The IM in the concept's name comes from Intelligent Mobility, the current Nissan buzzword for bundling electrification, connectivity and autonomous driving. The x stands for crossover. 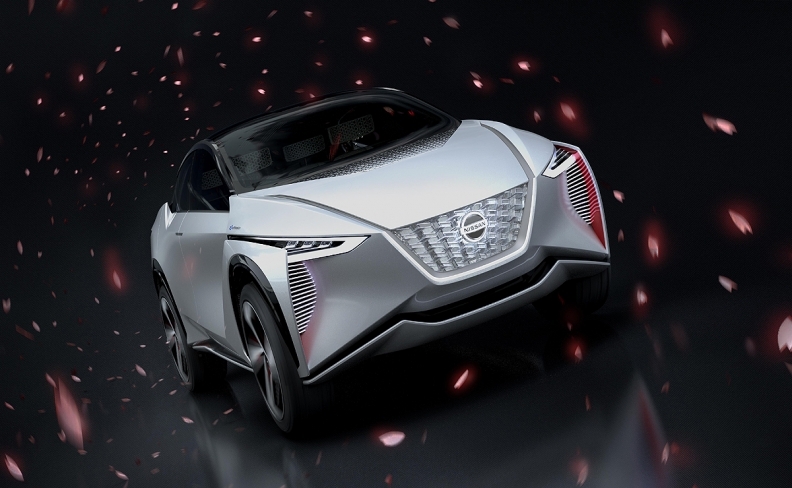 TOKYO -- Nissan's edgy new IMx crossover concept delivers a vision of the carmaker's 2020 technology game plan while ticking all the boxes for what's hot and trending. Utility vehicle packaging with four-wheel drive? Check. Zero emissions? Check. Autonomous driving, artificial intelligence and on-the-go connectivity? Check, check and check. And, to boot, the all-electric crossover, unveiled Wednesday at the Tokyo auto show, might just accelerate faster than a Nissan GT-R. The design looks futuristic, with its chiseled face and plethora of slits. But executives say it previews a host of technologies Nissan aims to bring to market starting around 2020. The electrified drivetrain technologies will arrive around then, while the advanced autonomous driving features come two year later, around 2022, executives said. The IM in its name comes from Intelligent Mobility, the current Nissan buzzword for bundling electrification, connectivity and autonomous driving. The x stands for crossover. "This is not a dream concept car," said Taisuke Nakamura, the vehicle's program design director. "This is something that can be realized in the near future." The concept tantalizes on two fronts where Nissan's flagship Leaf electric hatchback falls short. The first is range, with the IMx envisioning much better performance than the just-released second-generation Leaf. The second is serving up something in the red-hot utility segment, where consumers increasingly hanker for electrified options. 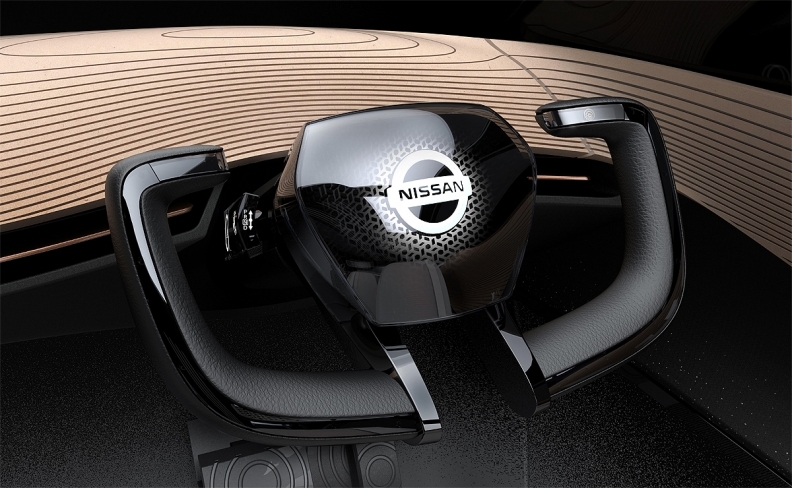 Inside, the steering wheel folds away when the driver kicks back in autonomous-driving mode. Nissan executives have been hinting for months they want an electrified crossover. Daniele Schillaci, Nissan's executive vice president for zero emissions as well as global marketing and sales, said in September it was reasonable to think the company would have an EV crossover in the "near future." Alliance partner Mitsubishi Motors plans its own electric crossover at the Tokyo expo, a coupelike four-wheeler dubbed the e-Evolution Concept. Nissan's IMx answers the call with crossover styling and four-wheel, all-electric drive. It also foreshadows a new dedicated EV platform Nissan wants to debut around 2020. The architecture underpinning the IMx will support EVs across numerous segments in a layout that delivers a flat vehicle floor with ample room for battery packs, said Toshiyuki Nakajima, manager of Nissan's advanced engineering division. The EV platform will be shared with alliance partners Renault and Mitsubishi Motors, he added. "It was decided to launch a common platform for EVs," Nakajima said. "Different kinds of vehicles are going to be produced -- small-sized cars, hatchbacks, sedans, SUVs and large-sized vehicles. So, this platform is going to be used for producing these models." The IMx is envisioned with two electric motors, one powering the front wheels, the other the back. Each motor delivers 160 kilowatts of power for combined torque of a whopping 700 newton-meters (516 pounds-feet) -- more lift-off than the GT-R, Nissan's crown jewel sports car. "Huge torque is going to be generated with quick response," Nakajima said. "It is unprecedented performance." Nissan says it is targeting a range of 600 kilometers (372 miles) for the IMx when fully charged, considerably more than the redesigned Leaf's 150 miles. That will be made possible by a high-density, high-capacity battery, which will also capable of wireless recharging, Nissan says. On top of electrification, Nissan layers its ProPilot autonomous driving technology. Nissan surrounds the IMx with a 360-degree sensor field it says will enable fully autonomous driving. The system bristles with nine radars, 12 cameras -- six laser scanners and 16 sonar. The sensors detect pedestrians, oncoming cars, traffic lights and parking spaces. But it is the IMx's artificial intelligence that processes that input and decides how to drive. Nissan says the system would enable the IMx to cruise lots and park itself, with nobody onboard. "Fully automated operation is going to be targeted at the year 2022," said Tomoko Kakinuma, manager of Nissan's technology planning department. Connectivity comes into play when the car's computer interacts with its environs to locate that parking, suggest nearby restaurants or help navigate. Nissan calls it "city browsing" and the idea is to use augmented reality to project all manner of information onto the windshield. The IMx also stays connected by plugging into the local power grid. Nissan says it can serve as a "virtual power station," storing in its big battery energy that has been generated during the day by green means such as solar power. At night, when energy demand is higher, it can release the electricity back into the grid or even help power your home. On the streets, Nissan's wants a system that switches between human and computer at the driver's whim. And the design of the IMx reflects this, inside and out. Inside, the steering wheel folds away when the driver kicks back in autonomous-driving mode. Minimalistic "floating" seats lend a cozy mobile lounge feel when the computer is at the helm. Outside, the car signals it is operating in ProPilot autonomous mode by illuminating a strip of blue lights that arches around the edge of the roof over the side windows. The IMx's overall design, Nissan says, embodies "expressive purity" and "quiet dynamism." Executed in white and black, it exudes a crisp, technical feel like the latest digital doodad. The IMx's fastback silhouette and sloping hood aid aerodynamics, while its boomerang headlamps and taillights lend a futuristic look. Aggressive vents behind the front wheels evoke the gill slits of a great white shark, while more vents embellish the front and rear fascia. In the cockpit, a panoramic display wraps around the bottom of the windshield before melding into woodgrain-finished paneling. The digital display recedes behind the paneling and illuminates through the woodgrain lines to create a more open, airy atmosphere. The living room ambiance is enhanced by interior carpet molded with the pattern of karesansui, the immaculately raked dry rock gardens seen outside Japanese temples. Kakinuma said the IMx is still just a concept but one that should be taken seriously. "This is the vision," she said, "of the brand we are going to realize."